I always forget how much I love beetroot until I end up with little else to prepare for lunch or dinner. Then, I break into a sweat and wonder what on earth I can do to make it interesting. This recipe was invented on one such day. Now, I’m not for a moment going to pretend that quinoa is a cheap food. It’s not. That is to say, a 500g bag retails at about €7.00 but that bag gets you get about sixteen servings (4 meals of 4 servings). There is no waste and it’s full of various vitamins, calcium, folate, magnesium, maganese, phosphorus and potassium. It’s also very low in sodium. At least, that’s how I justify it to myself every time I baulk at handing over so much money for half a kilo of tiny grains. Beetroot and walnuts are one of nature’s obvious parings – like garlic and mushrooms or potatoes and leeks – so, in the spirit of ‘If it ain’t broke…’, I included them in this recipe. Wash the rocket if it’s not already washed. Snip the chillies with a kitchen scissors. Rinse the quinoa in a sieve under cold water. Tip the grains in to a saucepan and cover with the 300mls of cold water and bring to the boil. Once the quinoa is boiling, turn the stove down low and allow it to cook for another 15 minutes. You know it’s done when the little ‘tail’ sprouts out the back of each grain. While the quinoa is cooking, melt the butter in a saucepan over a low heat. Add the onions, chillies and walnuts. Stir them for a minute or two, until they are covered with the butter. Put the lid on the pan and leave to cook, stirring occasionally, for about ten minutes. Then add the beetroot and stir. Add the lemon juice and salt and pepper to taste. Tip in the quinoa (which should have absorbed all the water). Empty the rocket into a large bowl. 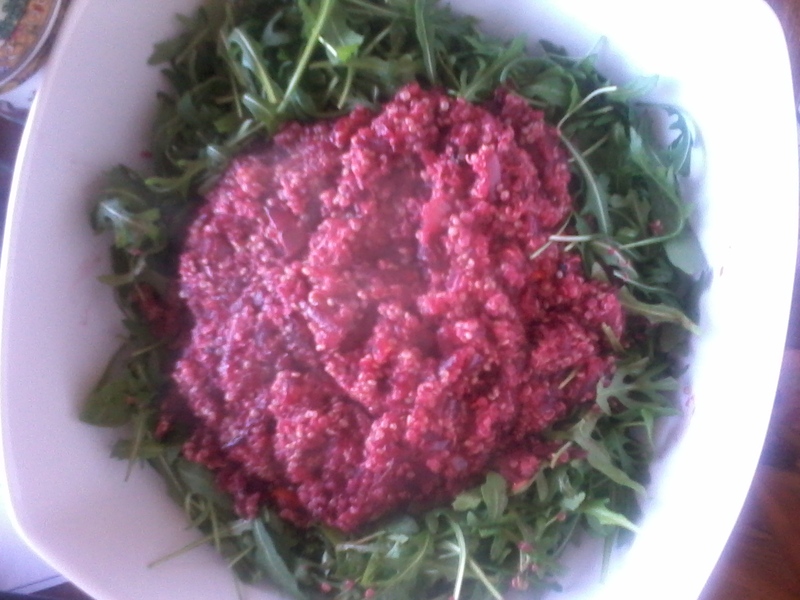 Pour the beetroot and quinoa over the leaves. We had this with boiled and buttered spuds. Yum! Posted on February 26, 2015 by Hazel Katherine Larkin	• This entry was posted in Austerity Bites, Recipe and tagged Beetroot, Quinoa, Rocket. Bookmark the permalink. I love this recipe so trying it out!! I love how quinoa can be used for so many different things. Great blog by the way.